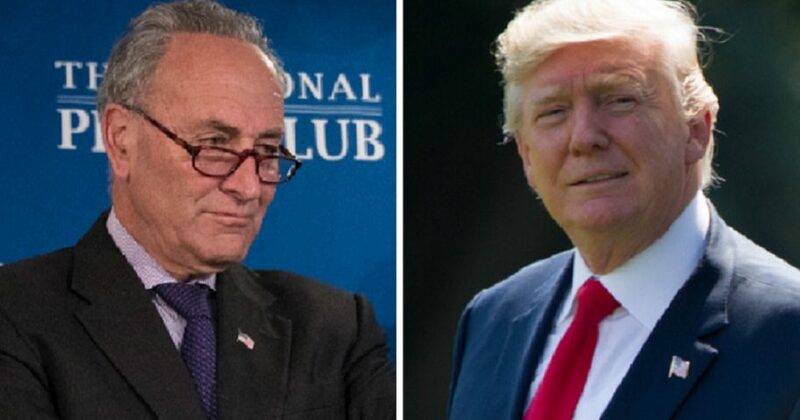 President Donald Trump accused Senate Minority Leader Chuck Schumer for being “weak and passive” on Iran policy via Twitter on Thursday, a day after the leading Democrat weighed in on Trump’s criticism of his intelligence chiefs. “Schumer and the Democrats are big fans of being weak and passive with Iran,” Trump wrote. Schumer and the Democrats are big fans of being weak and passive with Iran. They have no clue as to the danger they would be inflicting on our Country. Iran is in financial chaos now because of the sanctions and Iran Deal termination. Dems put us in a bad place – but now good! Trump had suggested that members of the intelligence community “should go back to school” for failing to grasp the volatility of Iran Wednesday after the release of the annual “Worldwide Threat Assessment” Tuesday, according to CBS News. According to Politico, Schumer wrote a letter urging three of Trump’s intel chiefs — CIA Director Gina Haspel, FBI Director Christopher Wray and Director of National Intelligence Dan Coats — to push back Wednesday. “You cannot allow the president’s ill-advised and unwarranted comments today to stand,” Schumer wrote according to Politico. Schumer also called Trump’s criticism of the intel chiefs “extraordinarily inappropriate,” reported Fox News. Schumer did not vote for the U.S. to be a part of the 2015 multilateral Iran nuclear agreement, according to Politico. But then-House Minority Leader Nancy Pelosi called the agreement “a diplomatic masterpiece” on July 30, 2015, reported USA Today. A total of 25 House Democrats opposed the deal. A story by The New York Times characterized Tuesday’s American intelligence assessment as “directly contradicting the rationale” of Trump’s Iran foreign policy. Intelligence officials did offer scenarios in which Iran could back away from a 2015 nuclear agreement during Senate Intelligence Committee testimony Tuesday. Trump withdrew from the agreement on May 8 and vowed to place sanctions on Iran because of the agreement’s “lack of perpetual ban on a nuclear program and how it fails to address the Islamic Republic’s malign activity across the Middle East,” reported The Daily Caller. The agreement still stands as a deal between Iran and countries other than the U.S. According to The Times, Coats’ testimony before the Senate Intelligence Committee belied Trump’s statements that Iran continues to pose a nuclear danger. “We do not believe Iran is currently undertaking activities we judge necessary to produce a nuclear devices,” Coats said. The Times acknowledged, however, that Coats said that Iranian officials have “publicly threatened to push the boundaries” of the nuclear agreement if it did not see benefits that were promised, including a resumption of oil sales and an end to American sanctions against its financial transactions around the world.